Amarube Railway Bridge in Kami, Hyogo Prefecture. 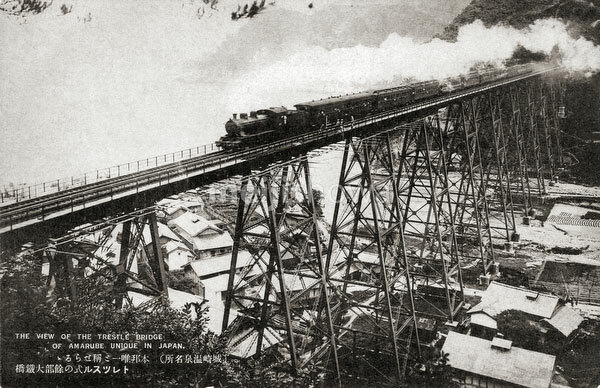 The Amarube Railway bridge on the Sanin Main Line opened in 1912 (Meiji 45) after 2 years of construction by 250,000 workers at a cost of 330,000 yen. Designed by Seiichi Furukawa, an engineer of the Ministry of Rail Roads, the 41m-high and 310m-long railway bridge was the biggest bridge in Asia at the time. The bridge was the site of a serious railway accident in 1986. On December 28, a train was blown off the bridge, fell on a fish-processing plant below and caught fire. Five women working at the plant and the train’s conductor died in the accident.